Moss Agate is a variety of agate which contains dark-colored inclusions that resemble moss, trees or other delicate branching patterns. Although these patterns may resemble organic forms, they are not made of plant matter, but are made of minerals  - and are known as dendritic forms; from the greek "dendron", which means "tree". Another example of a well known dentritic form is "jack frost" - the ferny shapes that ice can form on a pane of glass. In the case of moss agate, some sources state that the moss-like inclusions are caused by hornblende - an iron-magnesium silicate mineral (or more properly, mineral series) with varying amounts of other impurities such as manganese or titanium. Other sources state that the colors are caused by iron oxides (red) and manganese oxide (black)  , or chlorite. There is more discrepancy in statements about moss agate than there is around many other semi-precious stones - and it seems likely that moss agate has a number of possible mineral causes. 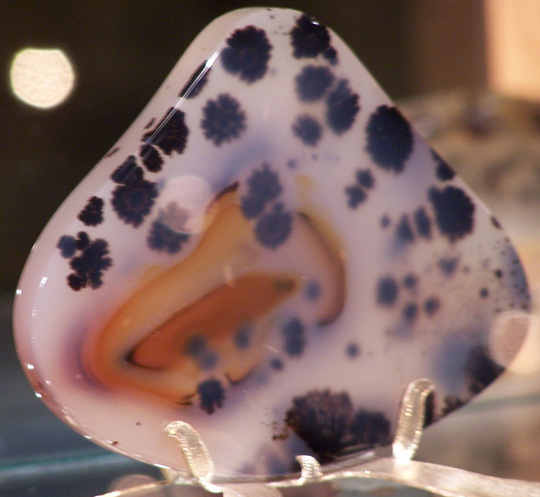 Moss agate has also been nicknamed mocha stone. Like other agates, it is chiefly composed of cryptocrystalline (i.e. with crystals that are too small to be seen with the naked eye) quartz. Some sources make a clear distinction between moss agate and dendritic agate - whereas other sources lump the two categories together: I have seen moss agate stated to be "also known as tree agate", and it is not uncommon to see "dendritic moss agate" advertised for sale! As far as I can understand, the distinction between the two is somewhat subjective; dentritic agate patterns resembling trees or ferns, and moss agate patterning looking like, well, moss... there doesn't seem to be a clearly defined line between the two. It is thought that dentritic forms occur when there is a limited amount of material available to form crystals, and when crystallization happens quickly. A simplified version of dentrite formation has been modeled by computer programs that make a visual representation of what occurs when "sticky" particles in chaotic motion encounter each other randomly - elegant forms are created. In the case of crystal formation, whether agate dendrites, ice or other minerals, there is an additional element - that of the rules of crystal formation. This is why ice crystals forming in air (i.e. snowflakes) take on forms that are hexagonal as well as random. Moss agate rough can be purchased online very inexpensively; for a few dollars per pound (Feb 2011). Moss agate pieces are also commonly available in worked form. These too can be very inexpensive. Typical forms created include polished pebbles, spheres, "palm stones", pyramids, eggs, beads, thin slices, cabochons and any of the other popular shapes - and these are often cut with large planar / smooth surfaces in order to best display the patterning. It is not uncommon for cut moss agate, as with other agates, to have been dyed in order to enhance its color prior to sale. 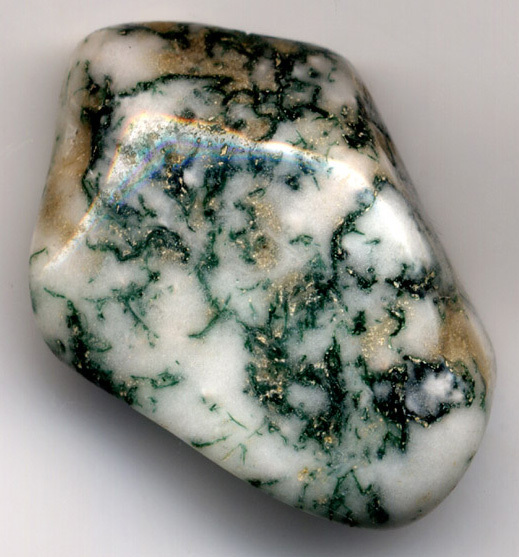 Moss agate is a stone with a veritable cornucopia of folklore surrounding it. It has been said by various sources to provide "assistance" and fortune to gardeners, warriors, midwives and even to the 14th year of marriage! It is reputed to bring riches and friends to the wearer, recovery from depression, a boost to the heart chakra, cleansing of the circulation, enhanced optimism and bettern concentration. I have seen it associated with Virgo, Taurus, Gemini or Aquarius - depending on where you look. Make of this what you will - it all sounds like clever marketing to me. I know this though; moss agate can be a very pretty stone. Looking at natural forms seems pleasing to the eye and calming to the mind.